Check out the step-by-step instructions and do it yourself. Go green this Christmas and decorate with recycled products from around your house. These do-it-yourself upcycled ornaments are the perfect way to repurpose old magazines you have lying around. To top it off, they make beautiful decorations and are an all-around fun holiday craft. We had professional crafter, Michelle Edgemont show us how to make the ornaments ourselves. Check out the step-by-step instructions below to do it yourself. 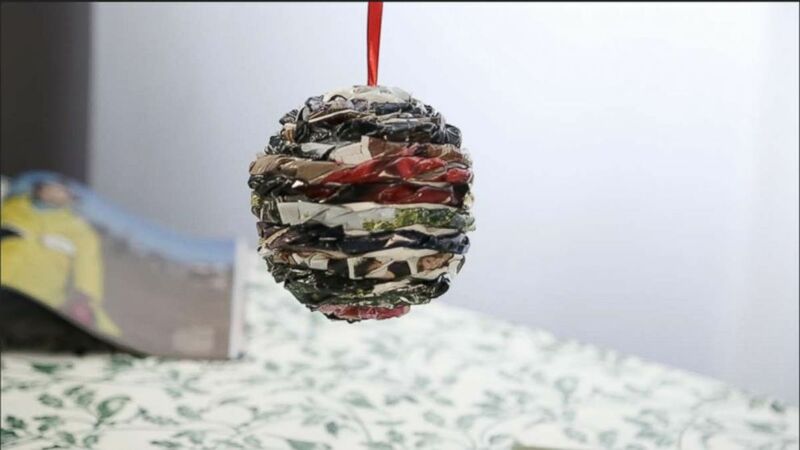 (ABC ) Turn old magazines into a beautiful holiday ornament. Add some holiday cheer to your tree with these DIY temporary tattoo ornaments. Deck the halls with this DIY succulent wreath. Brit Morin shares how to deck the halls with items you can buy on a budget. Rip out a few pages from your catalog or magazine, and roll the first piece up into a long strip. Twist the piece from each end. Use the glue to secure your magazine clips around the ball, attaching in a circle as you go. Repeat this step until the ball is entirely covered. Pro tip: Use an old tennis ball in place of a styrofoam ball to be even more eco-friendly. Cut off the extra length from the final strip of your ornament. Cut some ribbon and tie the ends together to make a loop and double knot. Poke a hole in the top of the ornament, then add some glue inside the hole and push the knot of your string into the hole. Let the glue cool.